As part of my new “back to basics” blog series, I wanted to re-post a blog article I did a few years back. I believe these timeless principles are so important yet easy to overlook on a daily basis. At the very core of any business, relationship, negotiation, event, or activity, these principles are keys to success. If you read, study and implement these on a regular basis, you will be amazed at the results. Enjoy. How to have power and confidence in dealing with people, by Les Giblin, is an amazing book and one of the top 5 books that help individuals improve their business and personal lives in a significant way. I took the liberty of posting the key points of each chapter to help paint the big picture. Hope it helps and inspires everyone. Have a safe and blessed day! 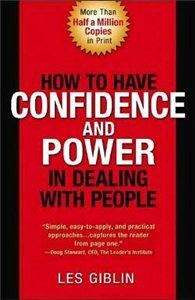 Key bullet points from each chapter of the book, “How to have confidence and power in dealing with people. 1. It is a proven fact that from 66 to 90 percent of all failures in the business world are failures in human relations. 2. So called personality problems such as timidity, shyness, and self-consciousness, are basically problems in dealing with people. 3. Learn the skills in dealing with people with confidence and you will automatically improve your own success and happiness. 4. Learn the underlying principles involved in dealing with people and you wont need gimmicks. 1. We are all egoists. 2. We are all more interested in ourselves than in anything else in the world. 3. Every person you meet wants to feel important, and to amount to something. 4. There is a hunger in every human being for approval. 5. A hungry ego is a mean ego. the sense of having some feeling of self-esteem and self-regard, it is impossible for you to feel friendly towards other people. 8. Help the other fellow like himself better and you make him easier to get along with. 9. People act or fail to act, largely to enhance their own ego. 1. Don’t be stingy in feeding the hunger for a feeling of importance. 3. Remind yourself that other people are important, and your attitude will get across to the other person. 4, Start today, begin to notice other people more. Pay attention to a man or child and you make him feel important. 5. Don’t hold it over other people or attempt to increase your own feeling of self importance by making other people feel small. 1. Whether you realize it or not, you control the actions and attitudes of others by your own actions and attitudes. 2. Your own attitudes are reflected back to you from the other person almost as if you stood in front of a mirror. 3. Act or feel hostile and the other fellow reflects this hostility back to you. Shout at him and he is almost compelled to shout back. Act calmly and unemotionally and you turn away his anger before it gets started. 4. Act enthusiastic and you arouse the enthusiasm of the other person. 5. Act confidently and the other person has confidence in you. 6. Begin today deliberately to cultivate an enthusiastic attitude. Take a tip from Frank Bettinger, and act as if you were enthusiastic. Soon you will be enthusiastic. 7. Right now, begin deliberately to cultivate a confident manner. Don’t mumble you words as if you were afraid to express them. Speak out. Watch your posture. A slumped figure signifies that you find the burdens of life too heavy for you to bear. A drooping head signifies that you are defeated by life. Hold your head up. Straighten up your shoulders. 8. Walk with a confident step as if you had somewhere important to go. 1. In dealing with people, you yourself sound the keynote for the entire theme, when you begin the interview. 2. If you start off on a note of formality the meeting will be formal. Start off on a note of friendliness and the meeting will be friendly. Set the stage for a business like discussion and it will be business like. Start on a note of apology and the other person will force you to play that theme all the way through. 3. When you meet someone for the first time, the impression you make then is very likely to be the keynote that will determine how he regards you for the rest of your life. 4. Other people tend to accept you at your own evaluation. If you think you are a nobody, you are practically asking other people to snub you. 5. One of the best means ever discovered for impressing the other fellow favorably is not to strive too hard to make an impression but to let him know that he is making a good impression on you. 6. People judge you not only by the opinion you hold of yourself but also by the opinions you hold on other things. your job, your company, even your competition. 7. Negative opinions create a negative atmosphere. Don’t be a knocker, and don’t be a sore head. The way, itself in which you ask things sets the stage or sounds the keynote for the other persons answer. Don’t ask no questions if you want yes answers. Don’t ask questions or issue instructions that imply you expect trouble. Why ask for trouble? 1. Accept people as they are. Allow them to be themselves. Don’t insist on anyone being perfect before you can like them. 2. Approve. Look for something to approve in the other person. It may be something small. Let the person know you approve of that. 3. Appreciation. To appreciate means to raise in value as opposed to depreciate which means to lower in value. Treat other people as if they were valuable to you. Thank them and give them special treatment. 1. Human relations often become deadlocked because each party is afraid to make the first move. 2. Don’t wait for a sign from the other fellow. Assume that he is going to be friendly and act accordingly. 3. Assume the attitude that you wish the other person to take. Act as if you expected him to like you. 4. Take a chance that the other fellow will be friends. It is always a gamble but you will win 99 times for every time you lose. If you just bet on his being friendly. Refuse to take the chance and you lose every time. 5. Don’t be an eager beaver. Don’t be overly anxious. Don’t knock yourself out trying to make the other fellow like you. Remember there is such a thing as being too charming and trying too hard. 6. Just relax and take for granted that other people do like you. 7. Use the magic of your smile to warm up the other fellow. 8. Starting today, begin to develop a genuine smile by practicing before your bathroom mirror. You know what a real smile looks like when you see one. You mirror will tell you whether your smile is real or phony. Also, going through the motions of smiling will get you in the habit and actually make you feel more like smiling. 1. Both success and happiness depend in large measure on our ability to express ourselves. Therefore start today to study ways to improve your talk. Keep at it day after day. 2. Practice starting conversations with strangers by using the warm up technique of asking simple questions or making obvious observations. 3. TO be a good conversationalist, stop trying to be perfect and don’t be afraid to be trite. 4. Nuggets and gems in conversation come only after you have dug a lot of low grade ore.
5. Ask questions to bring out interesting talk from others. 6. Use “ me too” technique to identify yourself with the speaker and his interests. 7. Talk about yourself only when invited to do so by the other person. If he wants to know about you, he will ask. 8. Use happy talk Nobody likes a goomy gus or prophet of gloom and doom. Keep your troubles to yourself. 9. Eliminate teasing, kidding, and sarcasm from your conversation. 10. Encourage the other person to talk about himself. Talk about the other persons interests. 1. The art of listening will make you rich. 2. Look at the person who is talking. Anybody worth listening to is worth looking at. It will also help you concentrate on what he is saying. 3. Appear deeply interested in what he or she is saying. If you agree nod your head. Respond to his cue, work with him. 4. Lean toward the person who is talking. 1. Dealing with people you may not agree with. 2. Let him state his case. 3. Pause momentarily before you answer. 5. State your case moderately and accurately. 6. Speak thru third persons, Let the other person save face. 1. If you want other people to help you, and go all out you must ask for their ideas as well as or their brawn. 2. Make the other fellow feel that your problem is their problem. 4. When you want someone to do you a favor make him a member of your team. Don’t just say, how about putting in a good word for me. Say if you were in my shoes and wanted to get favorable attention how would you go about it? 5. Set up your own brain trust and make use of the ideas suggestions and advice of other people. 6. Be sure when you ask for advice you actually want advice. DON’T Ask for advice if you want sympathy or a pat on the back. 1. Sincere praise miraculously releases energy in the other person, perks him up physically as well as giving his spirits a lift. 2. The person who is discouraging doing sloppy work or just hard to get along with is probably suffering from low self-esteem. Praise can act as a wonder drug to give his self-esteem a healthy shot in the arm change his behavior for the better. 3. Give others credit for what they do. Show your appreciation of what they have done by saying THANK YOU. 4. Be generous with kind statements. Gratitude is not a common thing. By being generous with gratitude, you make yourself a stand out. 5. Increase your own happiness and peace of mind by paying three sincere compliments each day. 2. Preface criticism with a kind word or compliment. 5. Ask for cooperation, don’t demand it. 6. One criticism to an offense. 7. Finish in a friendly fashion. KNOWLEDGE PLUS APPLICATION EQUALS SUCCESS! !